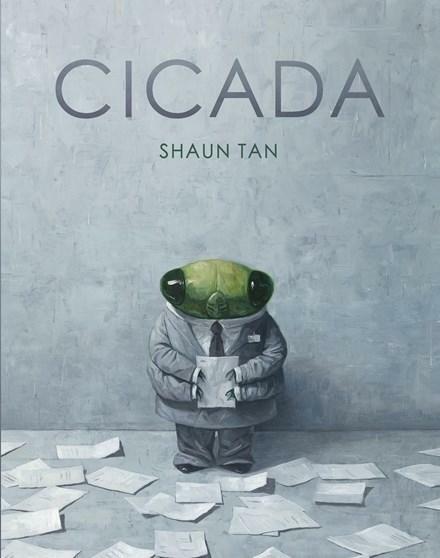 In Cicada, award-winning artist and author Shaun Tan has produced another stunning masterpiece of minimalist social commentary that will resonate with adults and children alike. The eponymous Cicada is an office worker in a cubicle in a grey, featureless building. For 17 years he slaves away, living onsite, bullied by co-workers and given no recognition. Upon retirement he climbs Escher-like stairs to the roof of the building. What happens then is simply extraordinary. Tan’s rich oil paintings depict the bleak office environment in shades of grey. Cicada’s green head is the only colour on many pages. The art is deceptively simple, allowing the viewer to project their own imaginings onto the page. The endpapers are divine. This magnificent picture book is the work of a master storyteller at the top of his game, pared back to only the minimum required to tell his story, leaving us to question and imagine further. It’s suitable for ages 4+. Bravo Shaun Tan!